The Varsity o Californie (UC) is a public varsity seestem in the U.S. state o Californie. ↑ "Annual Endowment Report, Fiscal Year Ended June 30, 2014; p.4" (PDF). Chief Investment Officer of the Regents of the University of California. 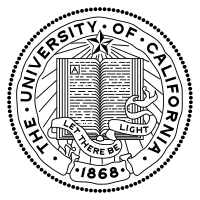 ↑ 2.0 2.1 2.2 2.3 2.4 2.5 "the university of california at a glance" (PDF). University of California. 2015. This page wis last eeditit on 28 Februar 2015, at 14:30.